The nuances of agility may seem complicated and difficult, but it’s just like any other sport! No one is born knowing all the rules to soccer or baseball and no one steps onto an agility field for the first time with a perfectly trained dog. Your trainer will help you and your dog learn the skills you need as well as what to expect at a trial. Just about everyone can compete in agility! 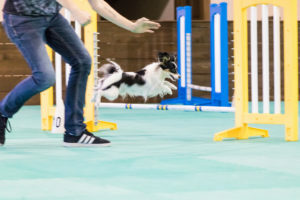 Agility fanatics love fast, handler-focused dogs (like border collies or papillons), but all dogs can be involved in agility. Jump heights and qualifying times are based on the height of the dog. This way, dachshunds aren’t competing directly against labradors. Dogs of all breeds, mixes, and sizes are eligible to compete! There are many organizations that you can compete with and each has its own criteria for the human competitors. AKC, UKI, USDAA, and NADAC are some of the most popular, and all provide junior handler programs. AKC, USDAA, and NADAC also provide accommodations to disabled handlers on a case-by-case basis. Why should I do agility with my dog? 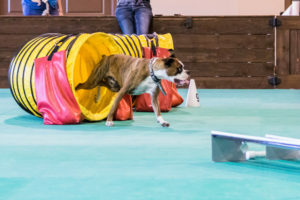 Whether you want to compete or just want to stretch your legs, agility is a wonderful way to continue training and build your bond with your dog. It keeps you and your dog active and provides an outlet for smart dogs to put all that brainpower to work. Have you ever let your dog run wild for hours, only for him to take a nap and be ready to go again? Games like fetch are great physical exercise but do nothing to mentally stimulate your dog. 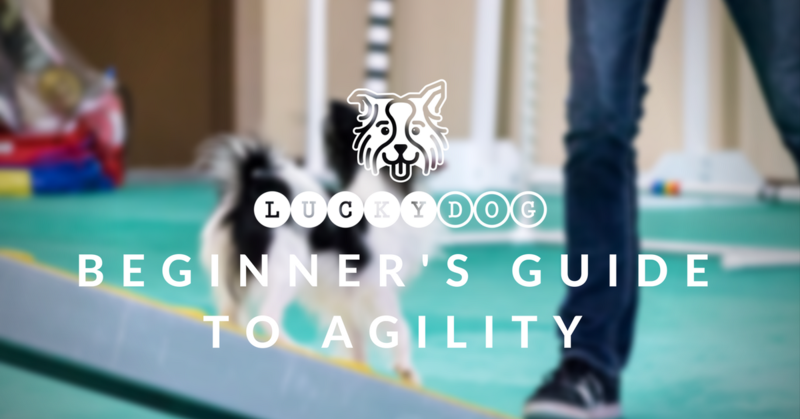 Agility is also great for improving your dog’s general behavior! It helps build confidence in shy dogs and gives destructive or barky dogs a job to do instead. One of the best things about agility is that it’s grounded in teamwork. You and your dog have to work together to run a course, and that means your dog has to actually listen to you. 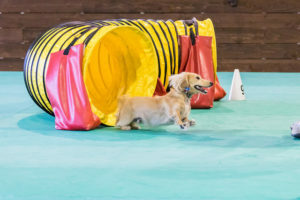 Agility is kind of like a reverse dog park- you get your dog in the ring with all these obstacles, let him off leash, and you get to be the most exciting thing there. At Lucky Dog, we’re proud to be beginner friendly. 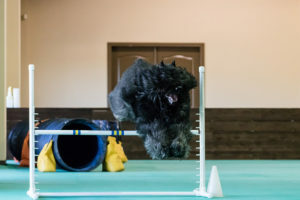 Our agility program can take you and your dog from the basic foundations to your first trial and beyond! We even offer a puppy performance class for those who are already hooked on the sport. Not sure if agility is for you? Check out our schedule and stop by to watch a class- humans only, please! You’ll get to see our instructors and students in action.